As I’ve mentioned before on here, I’ve recently taken up the fiddle. Fiddling is great because it takes a whole set of skills that are completely different from what I do for a living as a professor, but because I am also an academic, I find I need to know more than just how to play “Shady Grove”; I need, as with all things, to read some books about it. 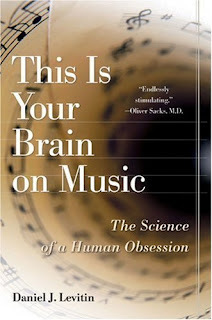 I picked up This Is Your Brain on Music a few years ago, because it just sounded interesting. On the first try, I only made it about one-fourth of the way through. But like many things in life, I thought maybe the book would become more interesting now that I’m actually attempting to become a musician. There are little tidbits in this book that are fascinating. There’s the story about the anthropologist who tells villagers in Lesotho that he doesn’t sing and gets laughed at. For those villagers, the division between performers and consumers of music is non-existent. If you can talk, you can sing, so of course we can all sing. When we say we can’t sing we’re saying that we cannot sing well, and I found it interesting to think about how we have become mostly consumers of music rather than makers of music. There’s also the comparison Levitin makes between Picasso and Miles Davis as artists: “The most critical aspect of the work, both artists said, was not the objects themselves, but the space between objects.” This made me think of some works of fiction as well, where what’s not said is as important as what is. Levitin does a nice job in moments pulling back the curtain and explaining to us how we interact with music, why we like what we do, and how we learn to become musicians. Part of what attracts us to music is “[T]he setting up and then manipulating of expectations…and it is accomplished in countless ways.” Levitin is both a neuroscientist and a former record producer, and there are times when I wanted to know more about the record producing, and less about the science. He tells this great story about Joni Mitchell and the bass player, Jaco Pastorius (Joni Mitchell can’t read music!). I wished there would have been less reporting of research on the brain and more stories about Joni Mitchell, but I did learn some interesting things. The only other musical instrument I’ve ever tried to learn was the piano, so I don’t have a lot of experience for comparison, but at least the way my fiddle teacher works, learning the instrument is also entering into a musical lineage. With folk, or old-time, or bluegrass music, there’s a very large canon of songs, and there’s a line of folks who have passed down what they know. I picked up Homegrown Music: Discovering Bluegrass at my local library to learn a bit more about that tradition. Stephanie P. Ledgin is a music writer who is immersed in bluegrass and she wrote this book in part to educate the legions of new fans who flocked to bluegrass after the release of O Brother Where Art Thou. This is a good, broad book that covers a lot of territory, but none of it in very specific detail. You might think of it as a standard textbook for the history of bluegrass. It’s great as a resource, as in the back she gives you a list of 25 essential albums and a whole bunch of other resources, but I’m still looking for more. I want to know about the histories of the songs, and how the fiddles got over here, and how did people get their fiddles, mandolins and dobros. So, if anyone has any suggestions for good books on fiddling or old-timey music or bluegrass, I’d be happy to hear them. Or interesting reads about music in general. My next review will be O Pioneer!, by Willa Cather, whom somehow I have reached a ripe old age without having read, but better late than never. I'm not a musician, but music is my second biggest passion after reading, so both of these sound quite interesting! I've also heard great things about Oliver Sacks' Musicophilia, though I haven't yet read it myself. I imagine it's more like the first than the second, though. Nymeth, I tried to read Musciophlia, but I just couldn't get into it. There's just something about Oliver Sacks I can't get into. I wish This Is Your Brain on Music had had a soundtrack with it. It really would have helped to be able to hear all the songs he talks about.